Mr. Martin Ngatia has put up a very strong case as to why President Uhuru Kenyatta should not be elected to serve for a second term. 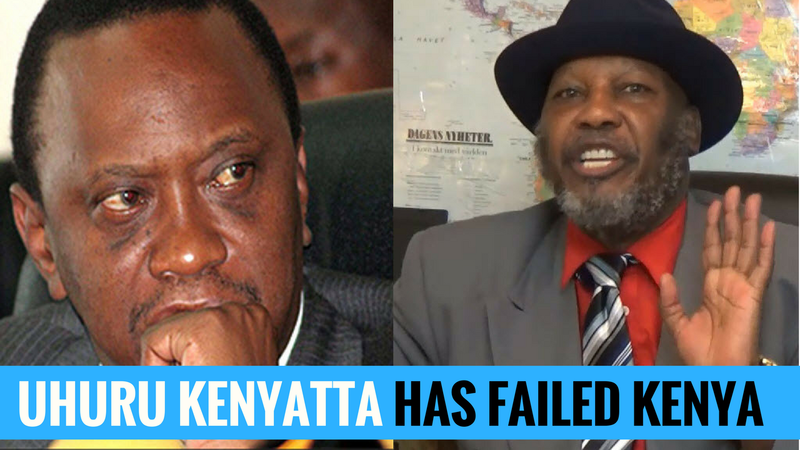 According to Mr. Ngatia, Uhuru Kenyatta has failed Kenyans and is technically presiding over a failed state. Ngatia argues that since he came to power, Uhuru Kenyatta has not delivered on a single election promise he made among 20 key promises. Top on the list is the inability of Uhuru Kenyatta to provide jobs for the youth and ensure that Kenya is a secure country where citizens can live in peace and harmony. Instead of creating jobs for the youth, Uhuru Kenyatta’s government has destroyed the National Youth Service (NYS), a major conduit for job creation. Upon assuming Office, Uhuru appointed his alleged girlfriend, Ann Waiguru as Devolution Cabinet Secretary thereby paving the way for the destruction of NYS through high level corruption that has never been witnessed in Kenya since the colonial revolution. Waiguru not only looted NYS with friends but Uhuru’s government defended her and today, she has been cleared by Uhuru’s government of multiple corruption scandals to enable her run for public office. A Report compiled by the Public Accounts Committee that investigated the scandal has been blocked from public release by Jubilee-allied MPs who fear that the Report’s content will damage the reputations of corrupt Jubilee thieves ahead of elections. Secondly, instead of securing Kenya’s security, Uhuru has been sleeping on the job. The situation is so serious that the President has even forgotten his soldiers who are being killed in Somalia by Al Shabbab fighters. The entire Health Care Service has grinded to a halt following more than 95 days of Doctor’s strike. Uhuru has been unable to resolve the strike and the latest is that the President has resorted to draconian and authoritarian methods of dealing with the Doctors who have refused to return to work until a Collective Bargaining Agreement they signed is implemented. The government has publicly stated that it will move towards the deregistration of the Doctor’s Union, a move that is in contravention of the Kenyan Constitution and International Law that both guarantees the right of workers to organize through Trade Unions without government interference. As the crisis of the Doctor’s strike continued to deepen, University lecturers also downed their tools to demand higher wages and better working conditions. The multiple strike actions in Kenya is a direct consequence of starvation wages which workers in Kenya continue to endure as politician’s salaries and remunerations continue to sky-rocket. According to Martin Ngatia, who is also the Chairperson of the socialist Kenya Red Alliance (KRA), there is no justification as to why Uhuru Kenyatta should be allowed to continue to govern. The President has invited the Chinese and opened Kenya for them to exploit. The government has not only borrowed heavily from the Chines but also allowed them to import Chinese workers to deprive Kenyans of jobs at a time when the unemployment crisis has reached epidemic proportions. In the video, Ngatia makes a clear case for the defeat of Uhuru Kenyatta’s government in August and appeals to Kenyan thinkers to come up and save the Nation with ideas. Watch the video and let us know what you think in the comments.